The Z. Smith Reynolds Foundation offers one two-year, paid fellowship (beginning July 1) to an individual who demonstrates an interest in philanthropy, public policy, community service and/or the nonprofit sector. This position is salaried and includes benefits. *Note: The ZSR Fellowship is distinctly different from the Exploratory, Visionary Ideas Strategy All For NC Fellowship. The fellow acquires increasing responsibility over the course of two years in evaluating grant proposals, visiting with grant applicants, assisting with grantmaking administration, working on projects of importance to the Foundation, and providing additional support to Foundation staff as needed. Through the grant process and related programs, the fellow gains experience with nonprofit organizations, public policy, Foundation trustees and other leaders across North Carolina. Each fellow has the opportunity to assist in furthering projects related to the current focus areas of the Foundation. The fellowship is structured to enable the fellow to further explore areas that are of interest to his or her professional development and that align with the Foundation’s goals, mission and vision. The fellow is also responsible for coordinating the Foundation’s internship programs. Thanks Jamilla T. Hawkins for sharing. I have tried all of my life to do what is best for my family. Yep I can get ignant some times but I act accordingly and the majority of the time I am responding to how one treat me. All I wish for is for family mines and others to stay close because we can’t choose who our family are but we can choose how we treat each other. My wife has not worked since we got married in 1997. I have never cheated on my wife and I have told her before I do that I will get a disvorce (like old folk say). LOL! We are good! I have told my children that I will help them as long as they respect me and act like responsible adults. My oldest daughter lives in Maryland and her mother and step-father brain washed her that I have never done anything for her. Any one that knows me and knows about my oldest daughter, they know how I took care of her. She stayed on my insurance til age 26. My daughter, her mother and her step-father all are preachers and I can’t believe they have not tried to get it right. I am good! I am not going into details about our relationship because those who know me and know my daughter’s name can put her name in the Search on my blog and read what I have written about that part. Yes it bothers me that I don’t have a relationship with my daughter but I tried and she rejected so I put that in God hands years ago. I will do anything for her today. Matter of a fact I seen something she posted on Facebook a couple of years ago and I sent her some money and I also sent her some money from my daddy. My next child my daughter we have our differences but we communicate. However she wants to be independent so hey I have no problem with that. I am glad she is gone back to grad school but she wouldn’t listen to me because she could have been finished with school after all of these years. My baby boy he wants to be a little independent but I told him that when he get more independent while living in my house things will be different. Moral of this story is for me and my house my wife and my children will either love me, hate me or they can move forward however they see fit. I have no control over grown folk. My oldest daughter will be 32 in April, my other daughter will be 27 in February and my son will be 21 in August. I love them all. Novaya Gazeta, a Moscow-based news organization known for its critical coverage of Russian politics, has reported a business connection between Leonid Teyf of Raleigh and Yevgeny Prigozhin, one of 13 Russians indicted last February as part of special counsel Robert Mueller’s investigation. Mueller, in a 37-page indictment, accused Prigozhin and companies he controlled, including the Internet Research Agency, of funding and orchestrating a campaign to influence the presidential election through social media and other tactics. 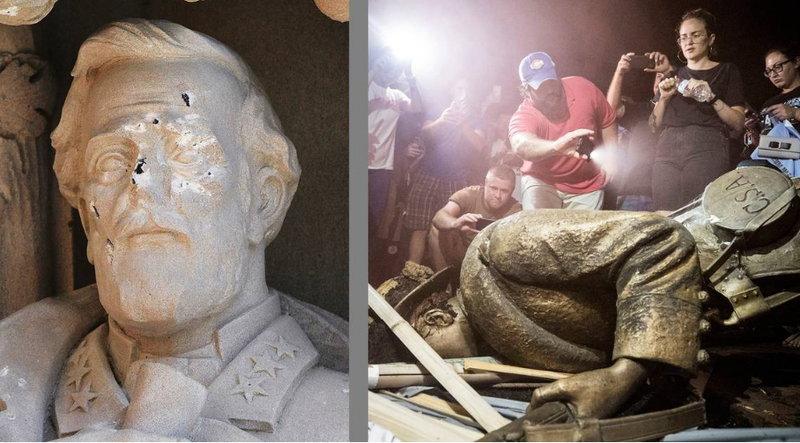 Another Confederate monument is on the verge of being taken down. A North Carolina city has written the owners of a statue of a Confederate soldier, saying it wants the monument removed, and it wants it gone by the end of the month. According to the letter written by City Attorney Angela Carmon, Winston-Salem wants the Confederate monument removed, in part, because of the outrage surrounding similar statues in N.C. and across the nation, and the danger that can follow. I have been receiving messages about a particular former deputy of the Edgecombe County Sheriff Office as to why he is no longer employed for around a month. I have not seen the deputy and I have not questioned the Sheriff. Folk say they read my social media sites because if they want to know what is going on and if they want to know the truth they have confidence in me. Well this is what I know. I know that when I videoed the swearing in of the newly elected Sheriff and his staff I know that the particular former deputy in question was not present. However there were some others who were not present because they were either working and came later after the 1st crew received their oath of office. I asked about one particular young deputy and another deputy told me he was out of town and that he would be back later in the week and would received his oath of office on that Friday. Although I talk to the Sheriff I don’t ask him about personnel or any information that is not public information and nor does he share information with me because that would be very unprofessional. Public information I receive Press Releases. I have never seen the Sheriff Office send out a Press Release after an election swearing in of officers about someone being terminated. I have heard about some others who are no longer employed at the Sheriff Office and folk have not been asking me about them. When I was told about those who no longer works with the Sheriff Office because they either quit and/or were terminated I have not asked why because ain’t none of my business. I have not heard from nor seen the deputy in question since he has not been employed with the Sheriff Office. The staff of the Sheriff Office works at the pleasure of the Sheriff and he/she can release anyone at anytime. This is the truth as I know it but if anyone know anything different, I stand to be corrected.